1 Heat oil in a heavy bottomed vessel, add mustard seeds, let them pop, add the cumin seeds, methi seeds and let them turn slightly red. Add split gram dal and let it turn red. Add garlic, red chillis, curry leaves, chopped onions and green chillis and sautÃ© till onions turn slightly pink (approx 3-4 mts). 2 Add the thotakura leaves and stir fry for 4 mts. Add the turmeric pwd and salt and mix. Cover with lid and cook till the greens cook (approx 7-8 mts). 3 Add the tamarind extract and jaggery and mix well. Add 1 1/2 cups of water and cook for another 9-10 mts or till the rawness of tamarind disappears. Sprinkle the rice flour and mix and you will find that the gravy thickens. Cook for a minute, add mustard pwd and mix. Turn off heat. 4 Serve with white rice. Blanching of amaranth leaves Boil 2 cups water in a deep vessel. Add salt, pinch of turmeric pwd and chopped amaranth leaves and cook over medium flame for 5 mts. Strain and use left over water to prepare chapati dough and use the blanched leaves and stalks as called for in the recipe. For the above recipe the leaves were not blanched. 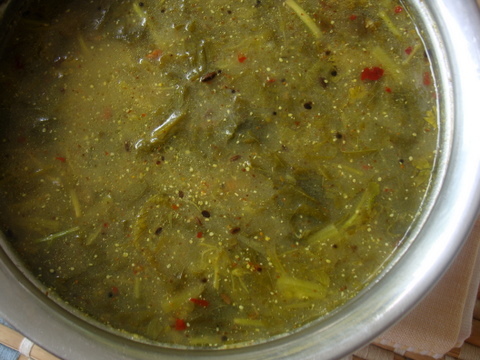 If using blanched thotakura, reduce the cooking time before adding water. Unusual combination of amarath, mustard and tamarind. Must try it out. Is there a reason why you blanch the leaves instead of adding them directly? No particular reason. I usually blanch for stir fries and sometimes for gravy dishes. You can directly add the leaves without blanching. I have been meaning to ask you since long, what is the hindi name for Amaranth? I surfed a bit, but didn’t get any clear idea..
We have a green leafy bhaji called “Tandaljo” it’s rather neutral in taste, and needs lemon or tamarind and onion to enhance flavours.. Is Tandaljo same as Amaranth?? Also, other readers, please share any info you may have.. They go by the name of Chauli, Chowli, Chavleri Sag. Yes, Tandaljo is the Gujarathi name for Amaranth leaves. Very healthy stew, looks yumm! Hi Sailu … this amaranth stew looks interesting . I have never made a stew out of this green ( with daals it is different ) …. this one looks worth trying. Looks yummy…where can i find amaranth leaves? While searching for a recipe long time back, I happened to visit your blog. After that I have become a very loyal & frequent visitor to your site 🙂 . You have an amazing collection of recipes & whatever I try from your site is a sure hit recipe !!. And as always, your mouth watering pics….awesome..Thank you so much for all your efforts. All the best. Just cooked this–it was delicious, even though I didn’t have any curry leaves on hand. Thanks so much for the recipe; I’ll definitely be trying many more from your blog!